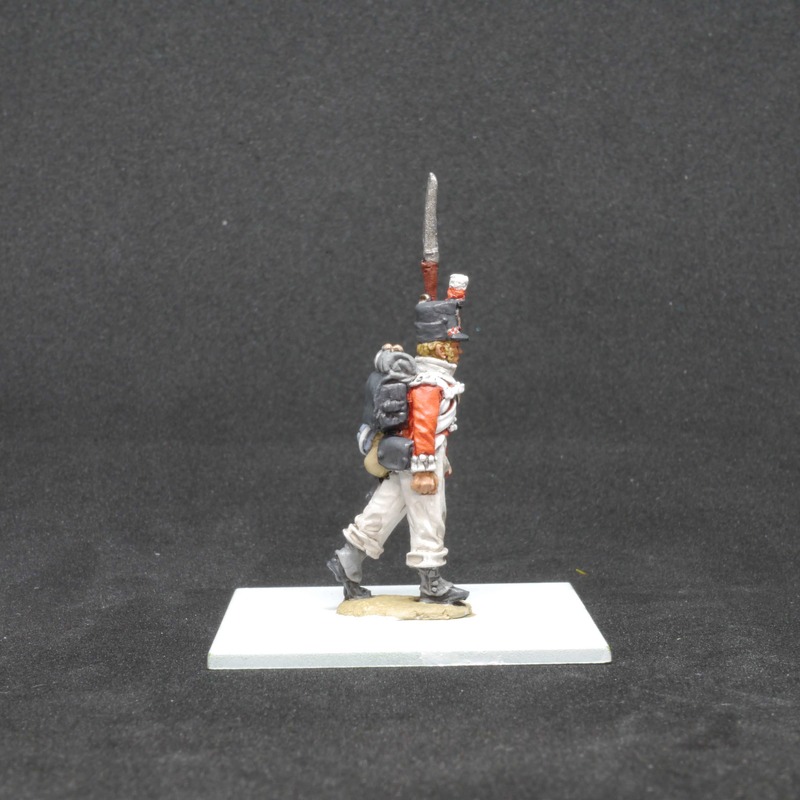 This project follows the collection and painting of the 3rd Division ('the Fighting Third') of the British Army in the Peninsular War. 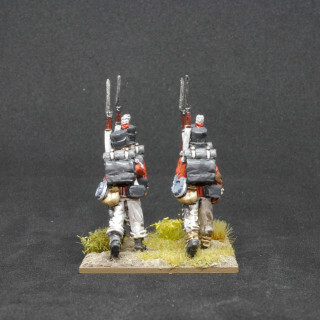 The project will look at the history of the units involved as well as focus on collecting and painting the force and the building of terrain for the army to fight over. 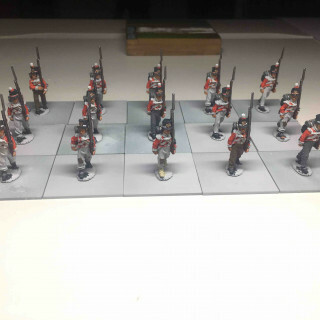 I thought I’d post a quick step by step guide to how I paint my British infantry for anyone who is interested. 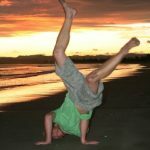 I am sure that there are quicker ways of going about this and there are definitely ones that achieve significantly superior results, but this is the way I go about it alongside a little bit of the why. The initial elements of the British Army landed in Portugal in August 1808 and it wasn’t until April 1814 that the war ended. In that time the army faced a drawn-out campaign over difficult terrain, going long periods without supply. 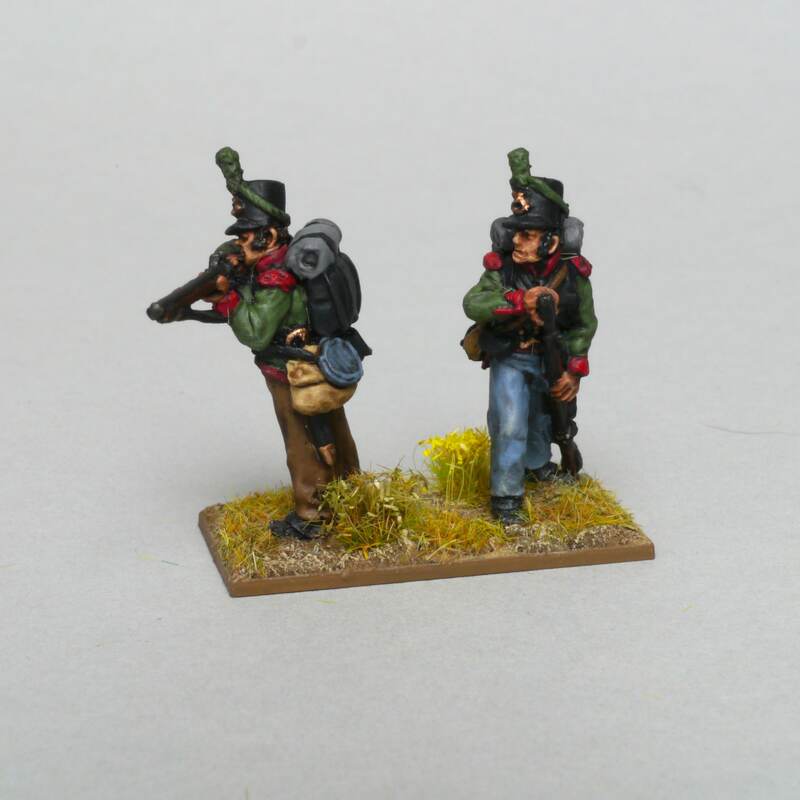 The Perry twins took this into account when they sculpted these figures, adding the rag tag look of an army on campaign. It was this look that I wanted to achieve with this army. These days I tend to use paints from all sorts of different ranges when painting. 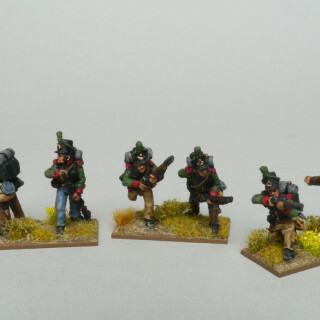 However, at the time I was planning my scheme for this project I was living in Thailand and the only gaming store I found, stocked Citadel paints. 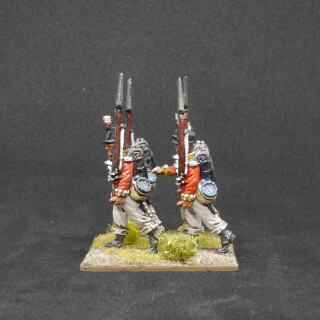 For this reason all the paints used for this project are from Citadel. I primed everything using Corax White from a can. 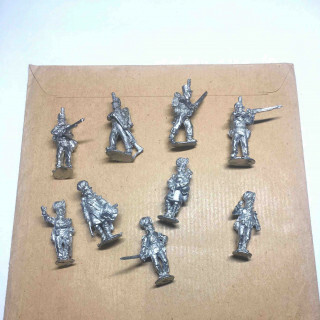 I find that this sticks better to the metal miniatures that I was working with as opposed to my usual white primer through an airbrush. With so much of the uniform either white or in bright colours, it made sense to start with a light undercoat. This is the step that takes the longest. In fact, once this step is finished the last two steps fly by! Not too much to say here as it is just a case of blocking in all the colours. 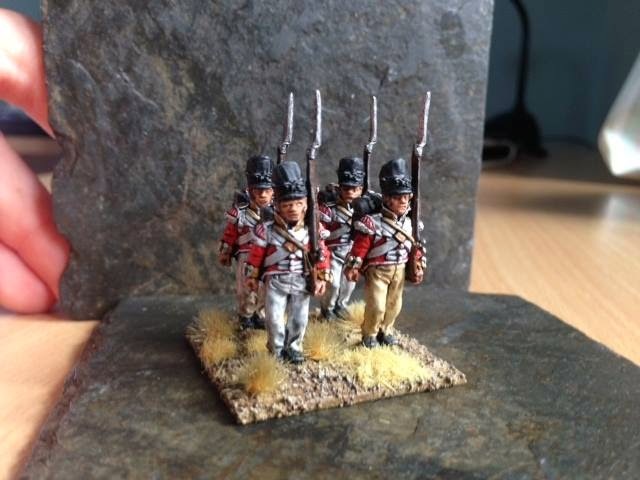 It is worth mentioning that I went for a lighter red reflecting the jackets fading in the sun and that I gave a few of the soldiers alternative coloured trousers to represent make-do replacements. This particular model is from the 74thand I’ve added a band of checks around the shako (see previous entry on Highland Bonnets). 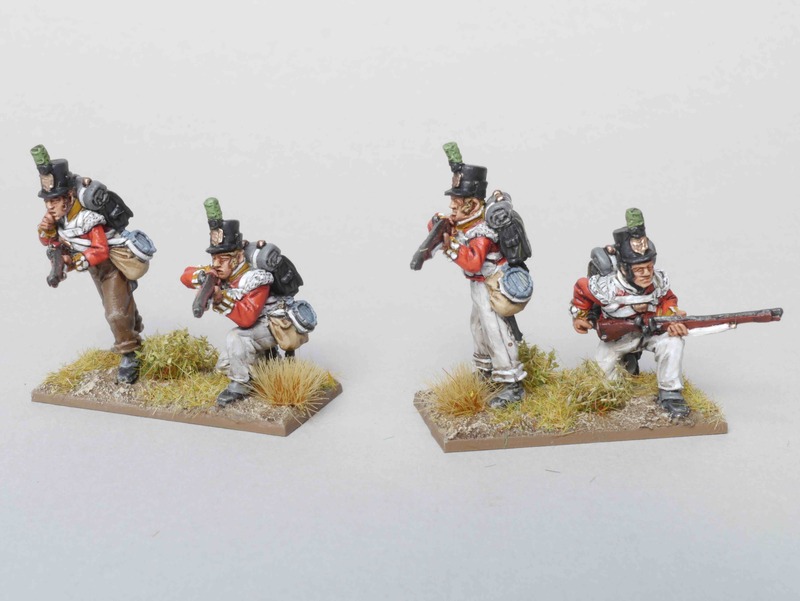 Cuffs – White Scar (for the 74th, different regiments have different cuffs. This is where the griminess is added to the figures. Being so small it is important that we create strong contrasts on the models. 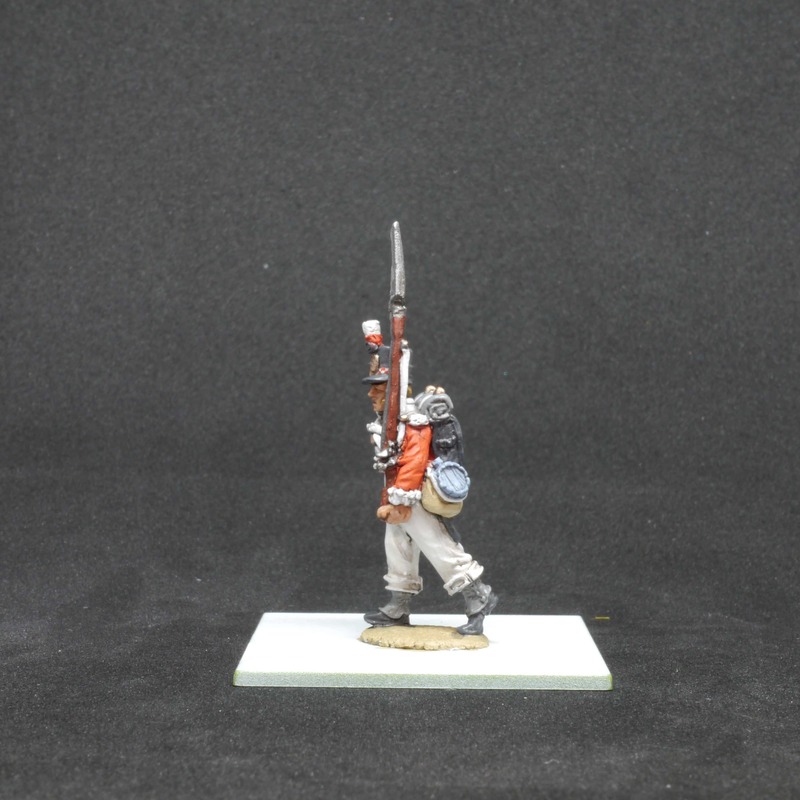 Again, to add further contrast and help the figures stand out on the table it is important to add some highlights. I have tried to limit them to the ones I think are most important as it is tempting to highlight everything and therefore extend the painting progress! Once based and ranked up the figures look good enough to grace the battlefield. They are not going to win a painting competition anytime soon but then that was never the point. I find that painting Napoleonics is a balance between quality and time. You could spend ages ensuring smooth transitions and adding in more details but most of this is largely invisible one the figures are on the gaming table. In fact, I think the opposite is true, strong contrasts and bright colours help these little guys stand out. 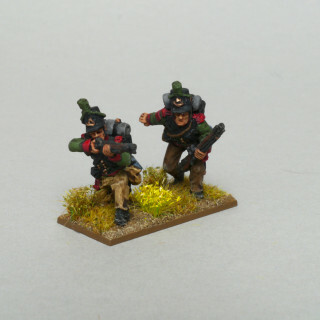 If you are setting out to paint an army of rank and file just remember that a unit of these figures based up and with Colours flying look infinitely better than a single model on its own. 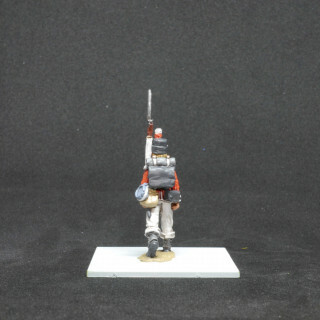 Peninsula Battle Honours: Rolica, Vimiera, Talavera, Busaco, Fuentes d’Onor, Albuhera, Ciudad Rodrigo, Badajoz, Salamanca, Vittoria, Pyrenees, Nivelle, Nive, Orthes, Toulouse, Peninsula. 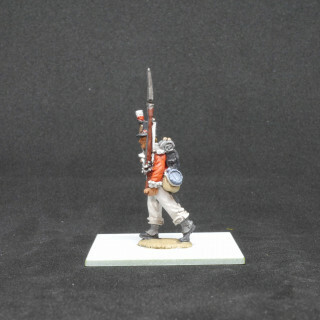 The British Rifleman’s place in popular history has been guaranteed through Bernard Cornwell’s Sharpe series. 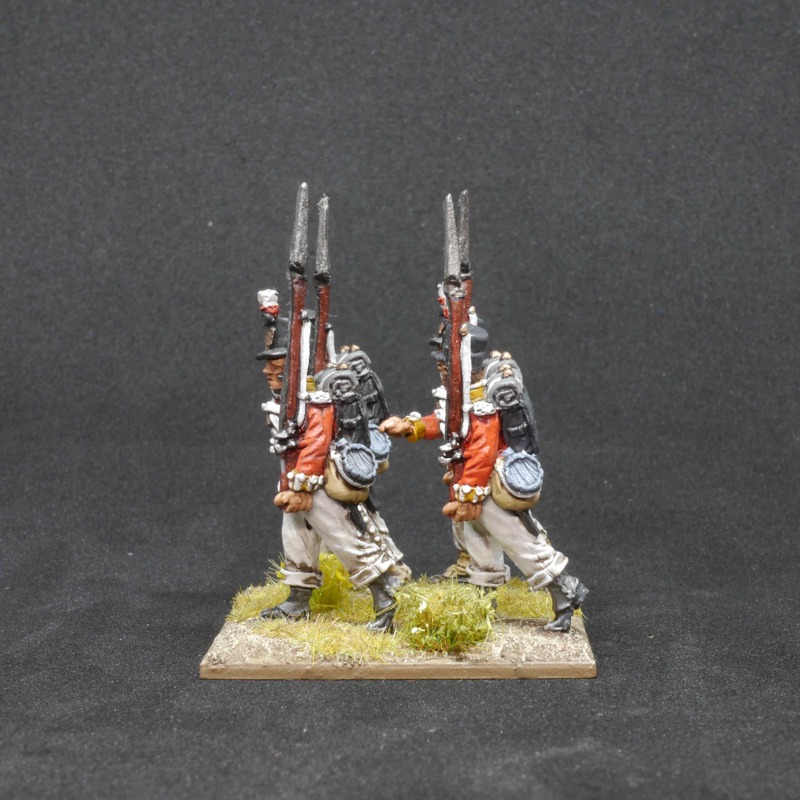 They were the elite skirmishers, at the front of technological and tactical advancements in an age that had, for the most part, seen little progress. To an observer, Napoleonic warfare looked very similar to that which had come 100 years previously. The sheer scale of armies had increased vastly with industrialisation, weapons were lighter/easier to use, but warfare was still conducted by close formations of men firing smoothbore muskets with cannon softening up targets from range and cavalry providing the ‘shock troops’ of the age. While this is definitely an oversimplification of affairs it is still a rather accurate one. 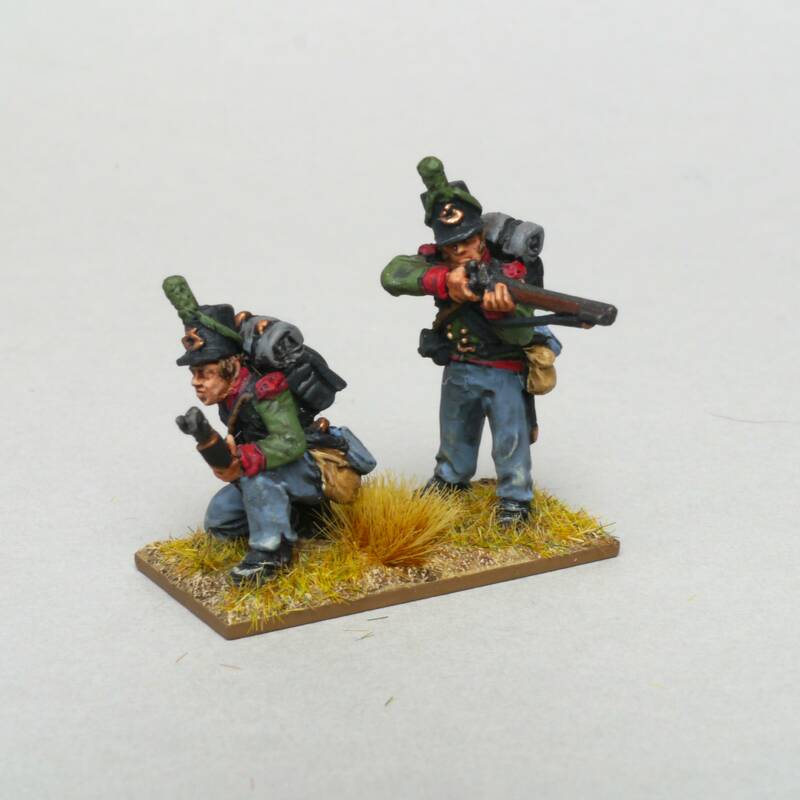 Rifles then, tore up the rules of engagement to an extent. 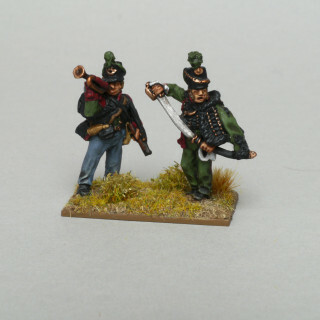 The British first saw the advantages in a new type of soldier through their experience in America where rifle armed sharpshooters had proven their worth in the dense terrain, taking out officers and sergeants with well-placed shots before melting back into the wilderness. In 1797, a 5th Battalion of the 60th Royal American Regiment was formed on the Isle of Wight to serve in America and made up largely by men of German decent. They would wear green jackets to better fit in with the forests of the New World Colonies and were to be armed with rifles. 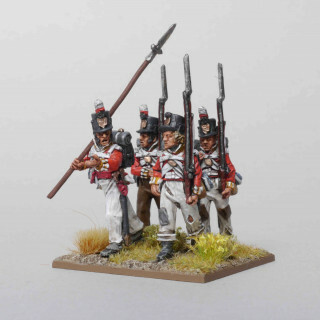 When Wellington landed in the Peninsular he recognised the importance of light infantry to protect and repel the hordes of Voltigeurs that were characteristic of Napoleon’s armies. 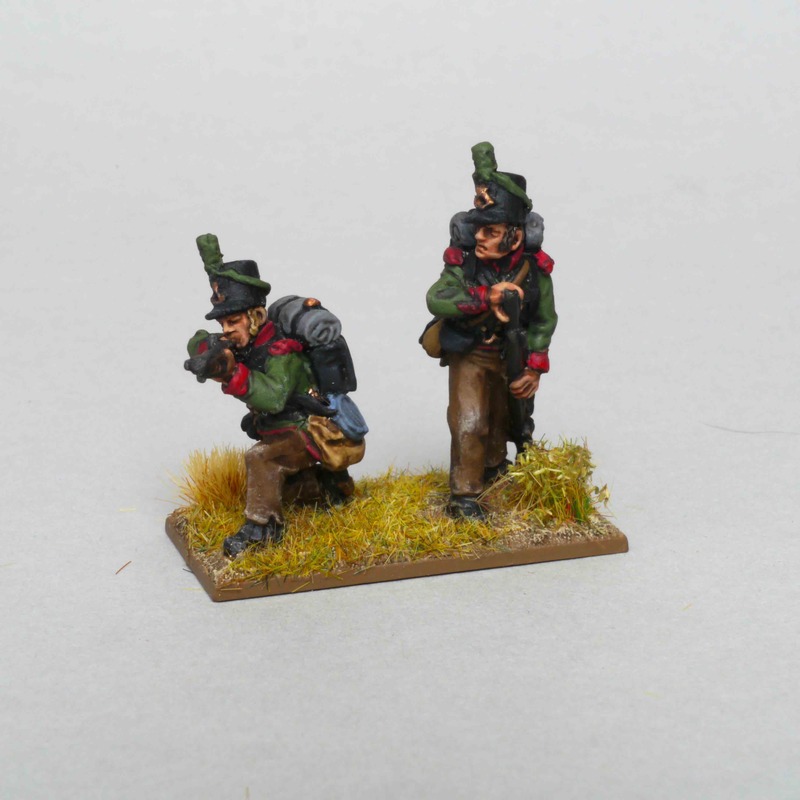 These Voltigeurs would shield the main French formations whilst whittling away at those of their opponents. 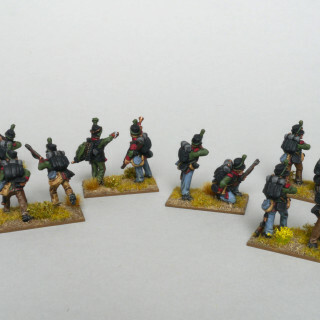 It was for this reason that the famed ‘Light Division’ was organised; tasked with keeping the French skirmishers away. In addition to this, Wellington ensured that each of his divisions could call upon at least one company of riflemen. 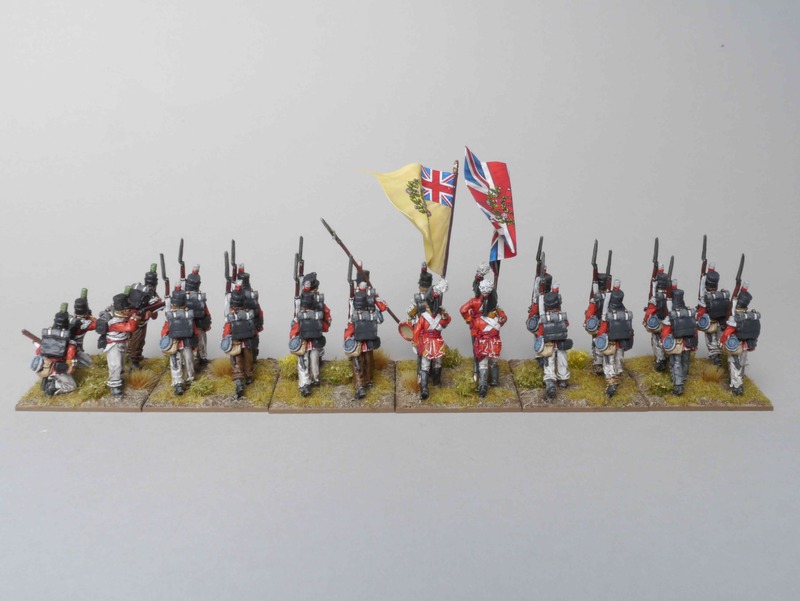 Whereas the 95th Rifles remained together as a coherent fighting force, the 5/60th Royal American Regiment were split up and distributed throughout the divisions. Picton’s 3rd Division had three companies attached which included the battalion’s HQ. This order would ensure that the 5/60th were present at nearly all the major engagements in the Peninsular. A history of the 5/60th attached to the 3rd Division is therefore really a history of the 3rd Division. Their role in the vanguard of British forces (riflemen were often positioned in front of the regular British skirmishers) meant that their heroics often went unnoticed and yet the cost in lives was expensive. 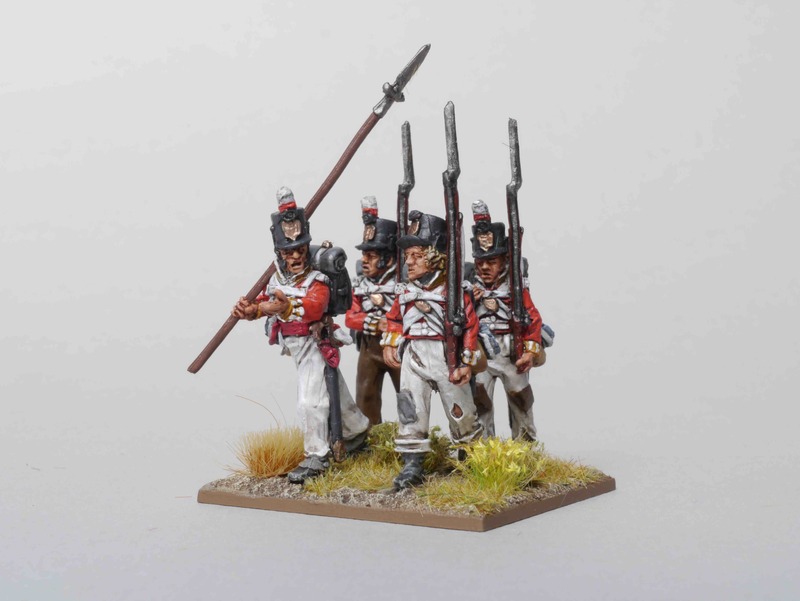 68 officers and 767 other ranks were killed or wounded, with 2 officers and 225 other ranks missing and yet these numbers do not take into account the numerous small skirmishes that must have sapped a significant number more.All this from a starting strength of 936 in 1808. I have attempted to remain loyal to the uniform that these brave men would have worn. 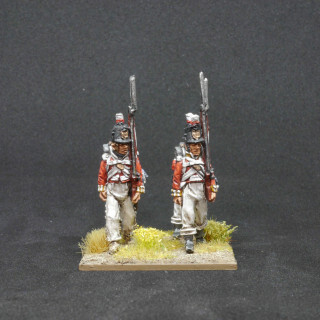 Their uniform was almost identical in style to that of the 95th and for that reason I have used Perry Miniatures 95th Riflemen but painted them with the scarlet cuffs and the blue trousers that they are supposed to have worn.Like all of my models, years of campaigning has taken a toll on them and most of them have turned to alternative trousers to replace those that they were originally issued with. 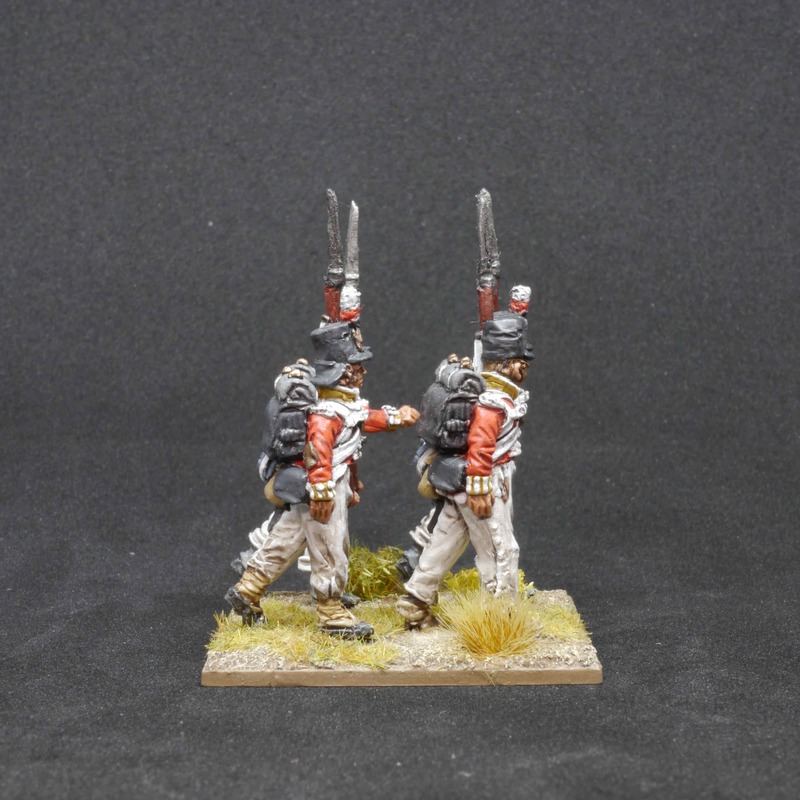 I decided to base them in pairs, as they would have fought, one model covering whilst their partner advances. 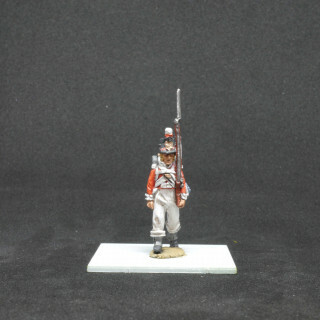 Lawford, James, ‘Wellington’s Peninsular Army’ Osprey Publishing, Oxford, 1973.
von Pivka, Otto, ‘Armies of the Napoleonic Era’ David & Charles Publishers Ltd, 1979, 141. It’s all in the timing and with hindsight it would have probably been a better idea to start this project in the new year! A busy December at work followed by the double whammy of Christmas with the family and New Years with my wife’s family, left me little time to do much in the way of painting. Thankfully, January has been more productive and I have managed to get three companies of the 5/60th Royal American Regiment of Foot done. 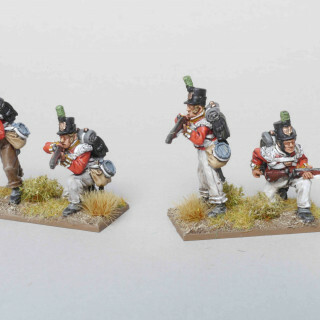 From what I can tell they wore similar uniform to the famous 95th only with red facings and blue trousers (there is some confusion between the sources on this but it would seem that they started out in blue before they eventually got replaced on campaign). I’ll do a brief history of their experience in the Peninsula in an upcoming PLOG post. 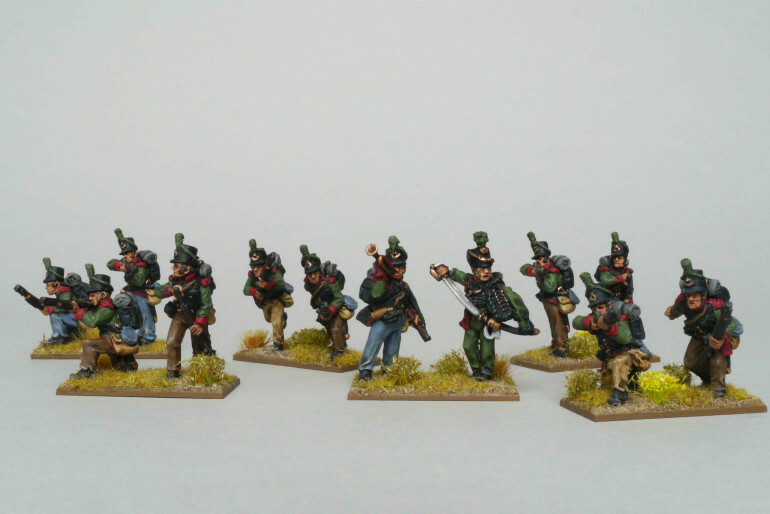 Next up are the 74thHighlanders. These guys left me in a bit of a conundrum. They were a Highland regiment but it seems in order to encourage recruitment from lowland areas they got rid of their kilts in 1809 and wore trousers instead (losing their Highland Status in the process according to some sources). I spent ages looking for evidence of their uniform but struggled to nail it down. 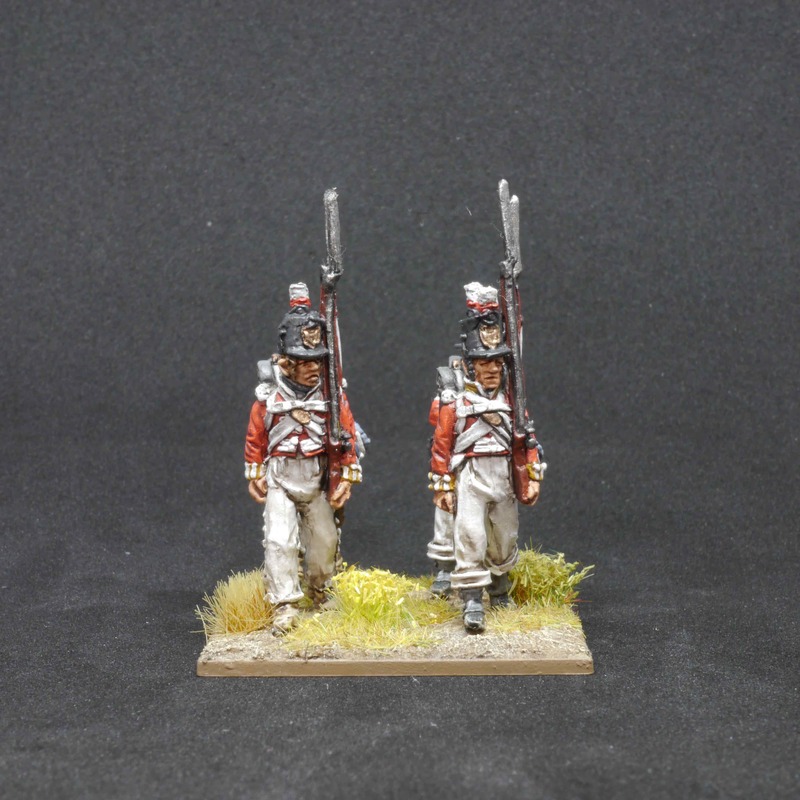 From what I can tell their uniform was almost identical to the regular line infantry, however several sources depict Highlanders with red and white chequered headband around their shako. 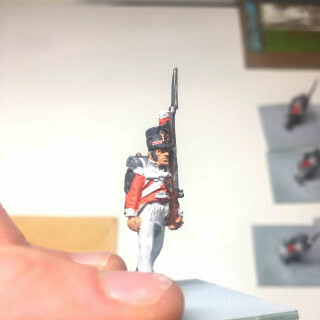 I wasn’t sure how to represent this regiment on the table. I was tempted to ignore the fact they switched out of their kilts and take liberties with history, leaving them fully kilted; after all, what’s the point of having a Highland regiment with nothing to distinguish them as such! 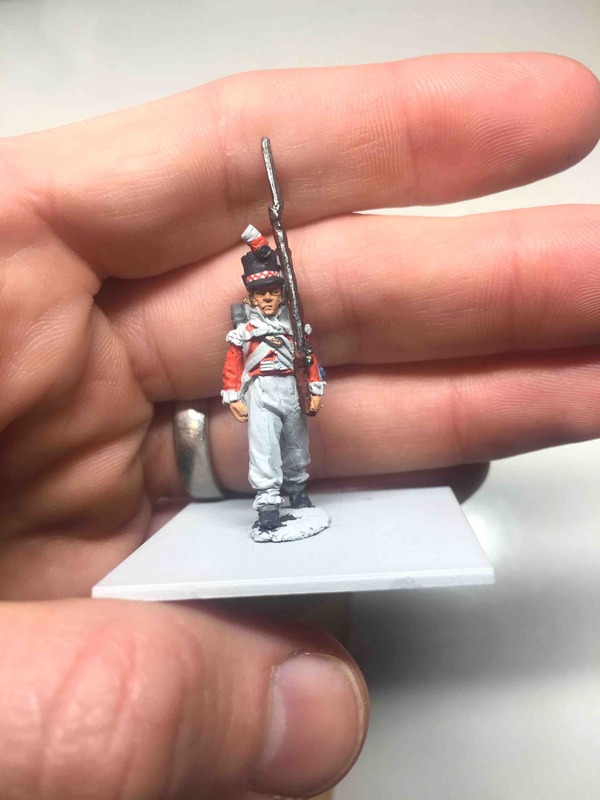 In the end I couldn’t ignore my research and so used the same Perry Peninsula figures as before but have been laboriously been adding the chequered headband that seemed to come up in many of the uniform guides. 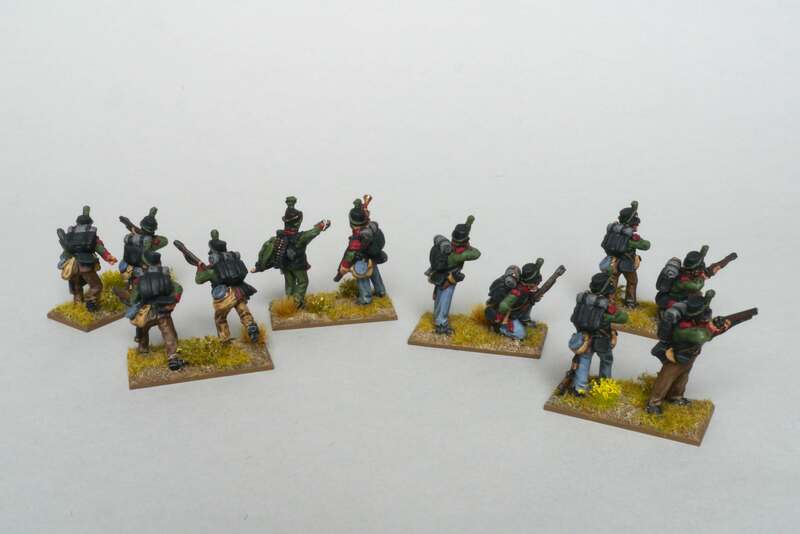 Once these are finished I have a couple of skirmish bases to finish and then I have decided to further strengthen the highland identity by adding in the Perry highland command stand. Officers were responsible for their own uniforms and I have seen many examples of drummers and pipers in kilts even when the soldiers around them were in trousers. If anyone knows more details about the uniform and status of the 74thplease leave it in the comments. Hopefully, my solution remains somewhat faithful to history whilst giving a clear nod to their highland roots. Peninsula Battle Honours: Talavera, Busaco, Fuentes d’Onor, Ciudad Rodrigo, Badajoz, Salamanca, Vittoria, Nivelle, Orthes, Toulouse, Peninsula. 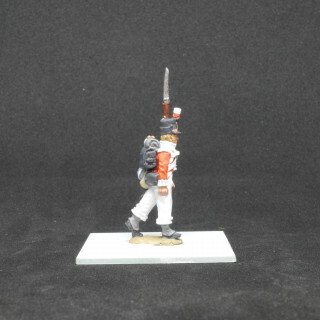 This would not be the last bayonet charge the Battalion was to make. 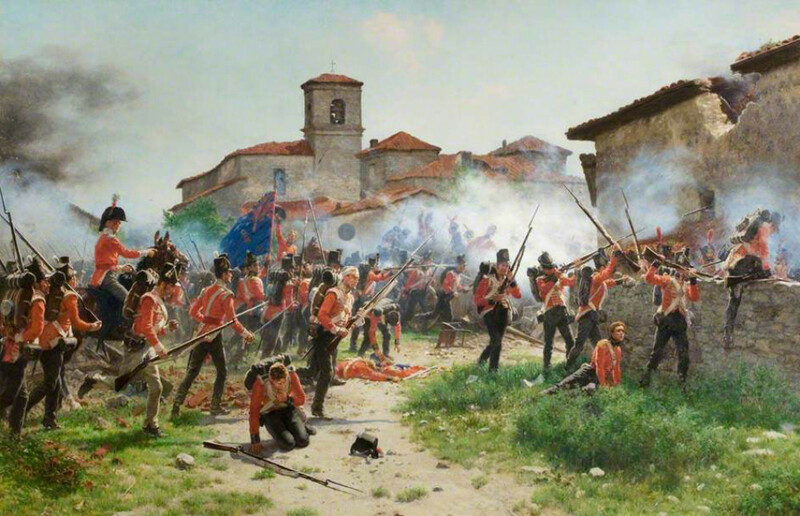 In 1811 the 1/88th led the counter attack against the French at Fuentes de Onoro (May 1811), blunting and then repelling Drout’s thrust on the village and turning the tide of the battle. 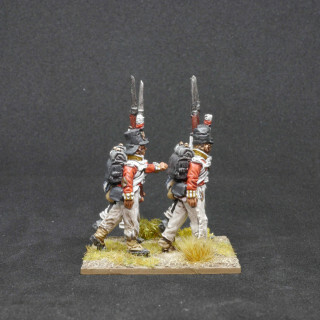 They followed this with bloody actions in the breaches of Cuidad Rodrigo (January 1812) and stormed the walls of Badajoz (March 1812) before playing a key role in routing the French at Salamanca (July 1812). There was little rest for Wellington’s veterans who were also present at the siege of Burgos (September 1812) and fought in the battle of Vitoria (June 1813). They would hound the remnants of the French army deep into France itself further proving themselves in the battles of the Pyrenees (July 1813), Nivelle (November 1813), Nive (December 1813), Orthez (February 1814) and Toulouse (April 1814). The 1/88th were in the thick of most of the major actions of the Peninsula. 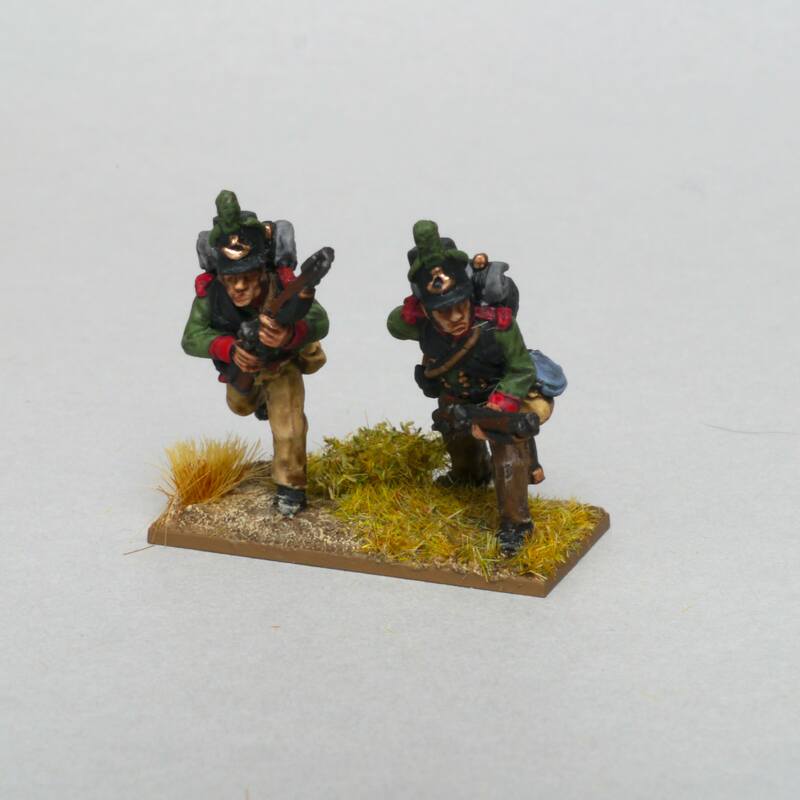 They took heavy casualties but new recruits were quickly integrated and kept the unit at fighting strength throughout. It seemed like a good place to start this project off from! 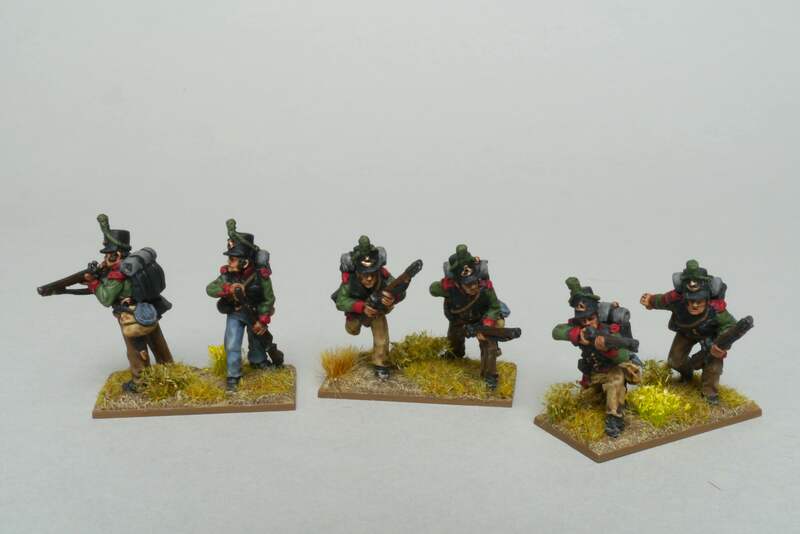 They will form part of the 1st Brigade of the 3rd Division. I have enjoyed painting these guys up. 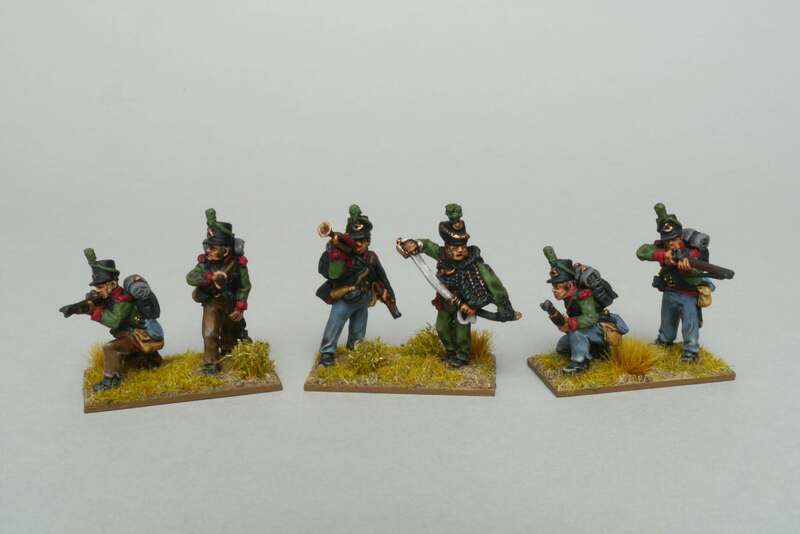 They really come together once the colours and bases are added. Overall, I am very happy with them. The figures are all Perry Miniatures and all metal which gives some real weight to the stands! Perry Miniatures do a variety of sculpts for the Peninsula and the best bit is that they really capture the battered nature of campaigning with some packs of ragged companies! I’ve mixed these in with the regular figures to give the appearance of an army on campaign. I also tried to keep the paint scheme deliberately grimy. The red on the coats has faded a bit in the sun and the trousers have been through hell and back (much like the men). Many of them have been replaced with the brown Spanish cloth that seemed to be so readily available. 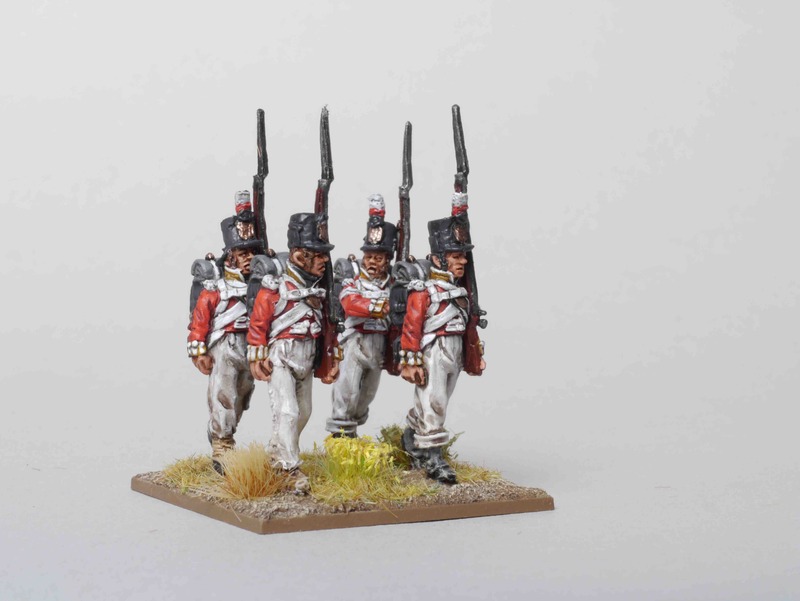 Wellington did not seem to mind non-regulation uniform so long as his men looked like soldiers and would not be mistaken for the French. The Colours are from GMB Designs and are beautiful. This was the first time I have ever applied paper flags and they look great (thanks to GMB Designs rather than any skill from me)! “Publish and be damned” was the Duke of Wellington’s response to a blatant blackmail attempt from one Joseph Stockdale. The attempt regarded the publication of Harriette Wilson’s memoirs (a famous London courtesan), and contained details of her alleged affair with the Duke himself. Publish and be damned also seems a fitting way to open this PLOG, albeit in an entirely different context! I’ve been a member of the Beasts of War community in name only for the past four years; content to read community posts and follow the team without engaging any further beyond that point. It has long been my intention to change that, but for a variety of reasons, I never did get around to it. This then is my opening volley, my powder is dry and muskets have been primed. Hopefully it will find it’s mark! My dad got me into wargaming when he bought and painted up a number of battalions of 15mm British Napoleonic infantry. Since then the hobby has become a central part of my life (much to the chagrin of my wife who refers to all figures, regardless of provenance, as “trolls”). My dad is coming up to retirement now and I wanted a way to repay the huge debt that I owe him both metaphorically and financially! How do you pay someone back who has played such a pivotal role in your life? 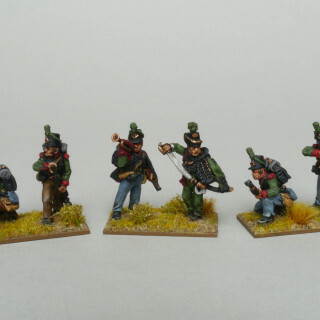 You paint them a Napoleonic army of course! 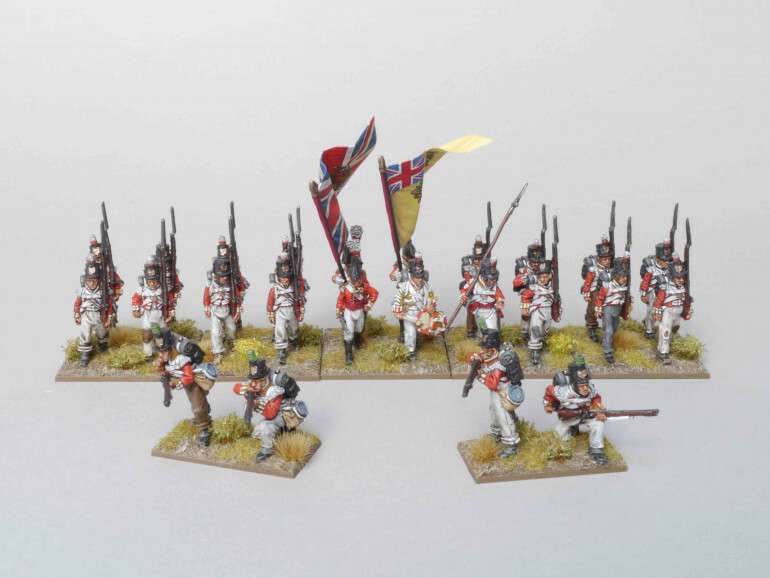 Napoleonic wargaming has often been referred to as the pinnacle of the table top wargaming hobby (usually by Napoleonic wargamers themselves)! 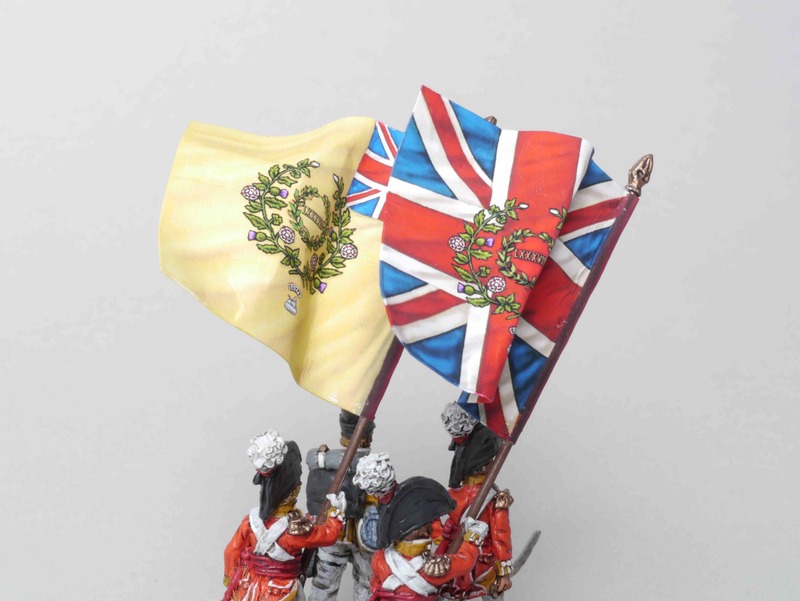 Whether you agree with this or not, a fully deployed army replete with unfurled colours on a bespoke gaming table is a sight to behold. 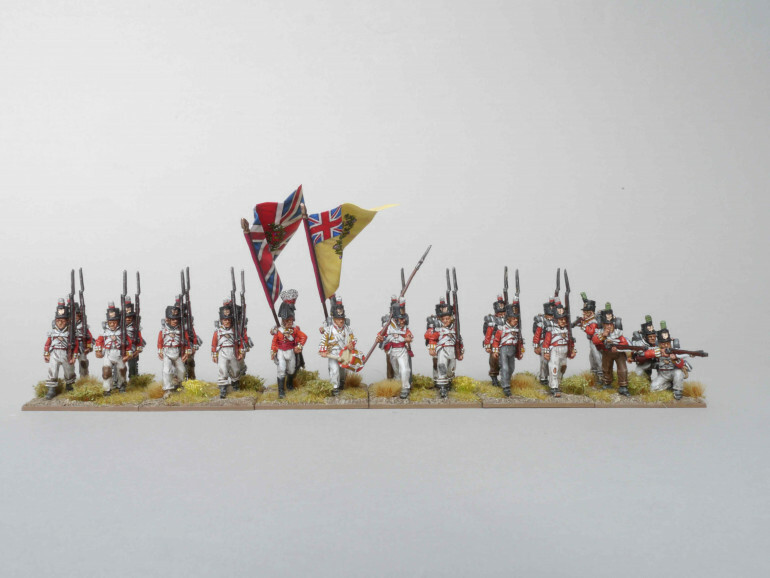 It is not however, an easy period to get into as a wargamer, not for lack of excellent model ranges, rules systems or historical material; rather down to the daunting prospect that to do it justice you need to paint up hundreds of figures. 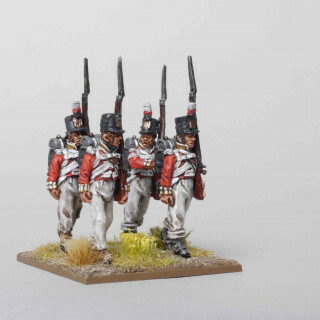 I am aware that there are some brilliantly written skirmish rule sets out there (I am thinking of Sharpe’s Practice in particular) but the Napoleonic era in its purest form is all about massed formations of infantry, batteries of cannon and ground-thundering cavalry charges. 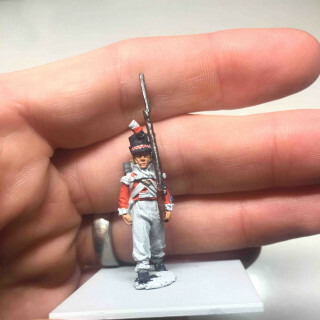 To do it justice requires dedication beyond that normally seen in other genres or time periods (or perhaps more accurately: the ability to paint hundreds of mind-numbingly similar looking miniatures over and over again). 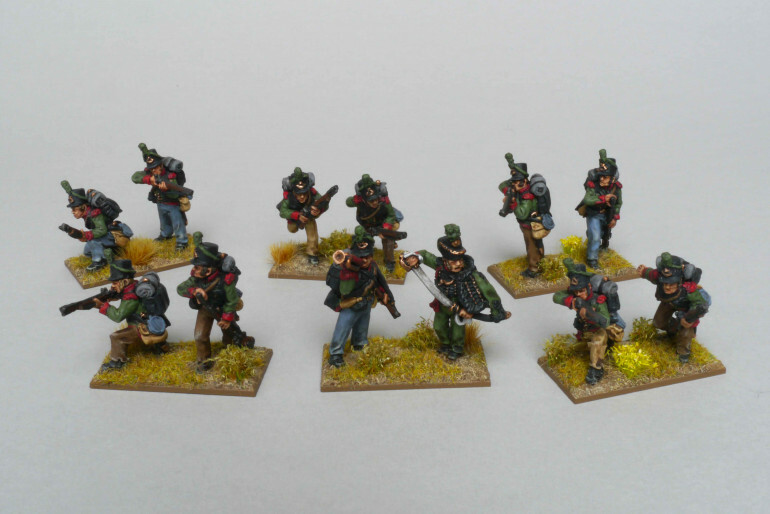 The army was to be in 28mm (for the sheer aesthetics, smaller scales just don’t compare in my mind). 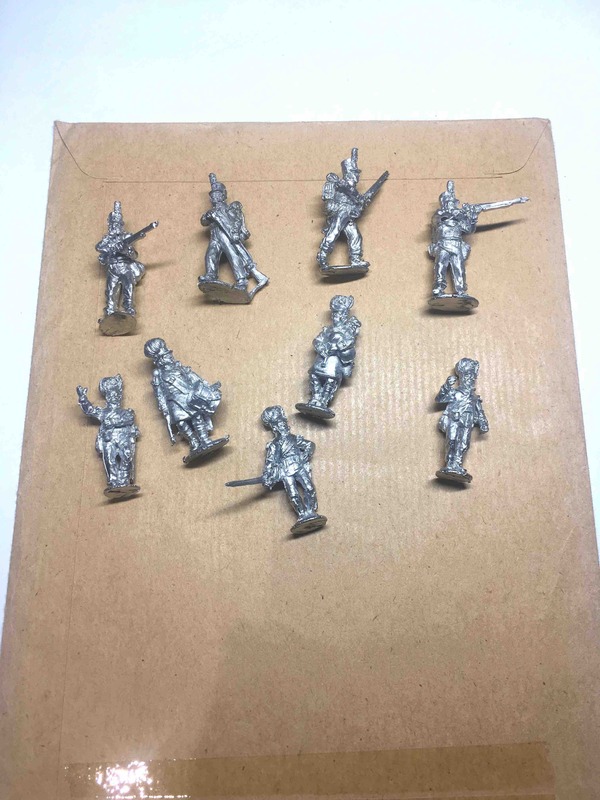 The army was to be all metal (there is something about the weight of the models that sets them apart from the, admittingly great, plastic kits available now). My dad has long had a deep interest in the Napoleonic era and the Peninsula war in particular. Therefore it would be to the Iberian Peninsula that I would look to for inspiration. 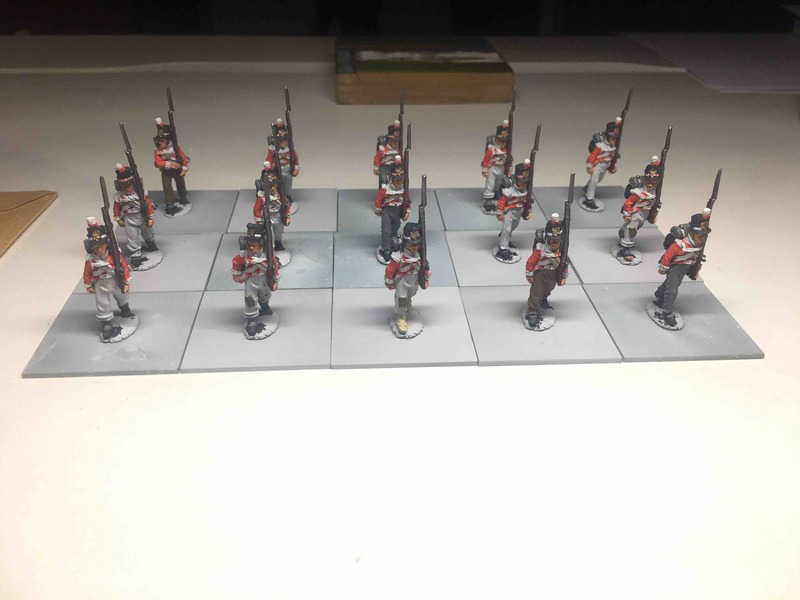 Thankfully, my uncle wanted to get involved too and is taking on the building and painting of a French army, so for now I can concentrate on the British and their Portuguese allies. A central part of the project is the building of a full battlefield for the armies to fight over. I would like to finish all of this in time for my dad’s retirement (a year and a half away). Both my dad and I are History teachers by profession so this would also give me the opportunity to delve into the history of the conflict and the regiments and individuals involved. 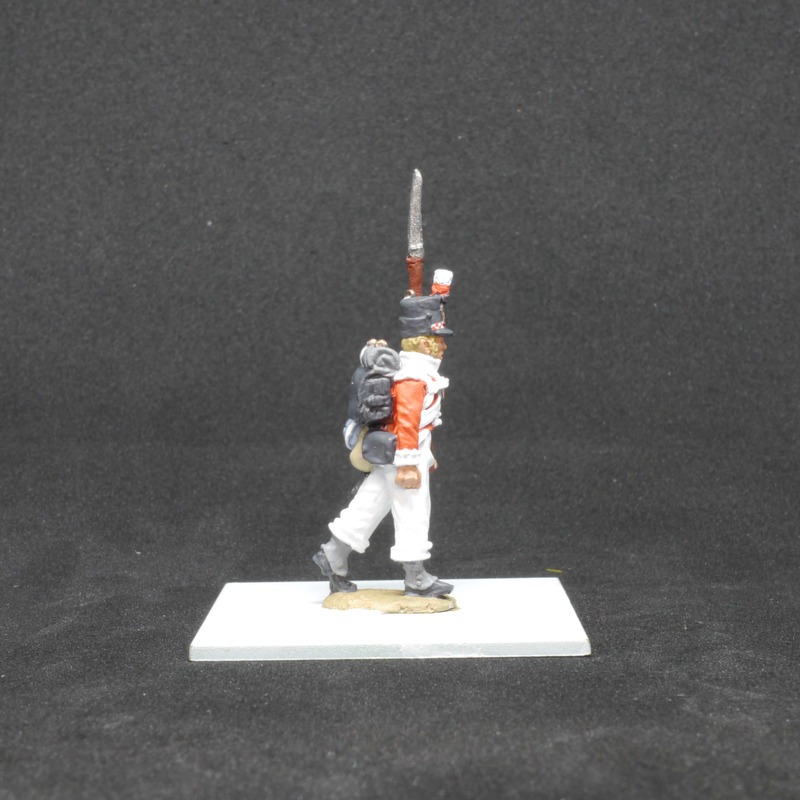 I plan on using the excellent Perry Miniatures for the majority of the army with a few Warlord models mixed in to provide some alternative poses. 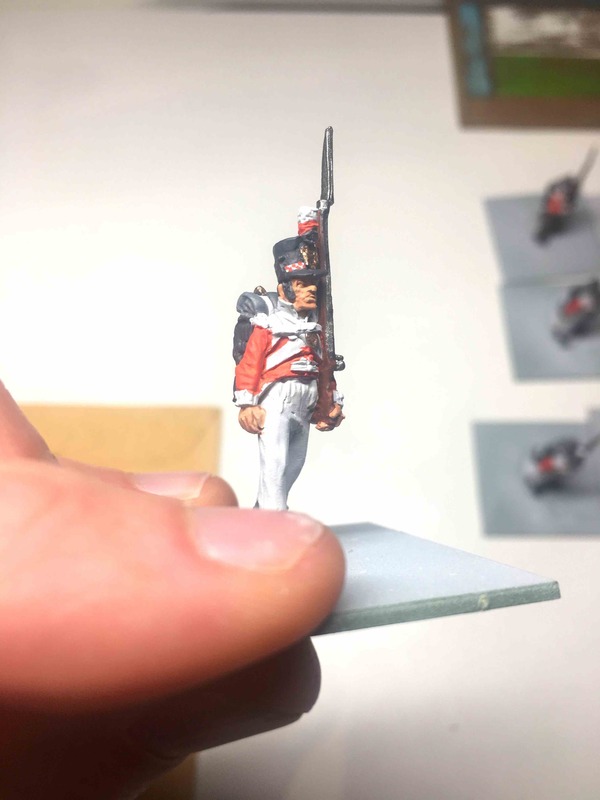 Test Stand of the 88th (the final figures will include some further highlights/revamped bases and be in pre-1812 ‘stove-pipe’ shakos).